4.2 out of 5 based on 158 bloggers and 50 commenters. 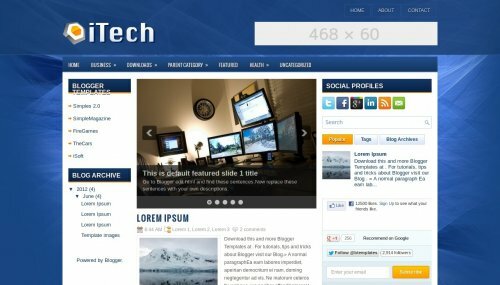 iTech is a free blogger template adapted from WordPress with 3 columns, left and right sidebars, ads ready, footer columns, slider, posts thumbnails, tabs, drop down menu, well designed threaded comments, abstract and geometric motifs. to install blogger template, log in to your blogger account, click on the ‘template’ tab/section; click on ‘Backup/Restore’ on the top right side of the template page. A pop-up should appear, just click on the browse to browse your template. Once you locate it, click on ‘upload’ on the blogger window. That will surely install it. Thanks for the templates . its very good design. How to remove the default share buttons attached with each post from the template..since I have add this..I dont want the default one..plz help !!! Template is okay . some changes to be done in template to look attractive. 3.after backup, load new template design by using restore. use the same button at right top. nice . I am using it now. Nice blog templete which i was looking for a long time. i really liked it. Professional looking template like wordpress. Why does your templates have “VBS:Malware-gen” in them? I just scanned them with virustotal…. We were unable to save your template. The template is very good for my blog. but i need to remove the ‘LABEL’ section on the left, the last section. and which place that i can replace my slider images? I’ve choosed, PBT Modern Car template because drop down menu. But I need each Menu have chikdren and sub children. Then I;ve copied the similar code but the result are failed. Message like ” Your template could not be parsed as it is not well-formed. Please make sure that all XML elements are closed properly. XML error message: The element type “ul” must be terminated by the matching end-tag “”. Love the template, very crisp and clean. Easy to install too! Only one issue and it’s probably user error… I can’t seem to get the main window with the 5 slides to rotate, any ideas/suggestions? @samer: Same problem is with me can you tell me how u resolve it? Awesome blogger template, did you design this template yourself? I’m using this template on my blog. It’s the most beautiful I’ve found, HOWEVER its XML code has A LOT OF bugs: layout problems, subscription area was missing and some duplicate content (still not solved on some pages). Hello friend , this template have an error where open the texts , the white backgroud not open and the stay over the blue backgroud. It’s OK indeed. I’ve fixed them, and soon I’ll find why it duplicates some contents. Thanks. I use it now…but how to change the pages abouve? To use the template download it first go to the blogger, select template and choose edit html and paste the code in xml file. The preview for my posts are not showing. It looks like code, but I know that the html is not wrong. Please help! Keren oeh, tapi masih bingung cara memasang templet baru soalnya tampilan dasbor blog saya udah tampilan baru bukan tampilan klasik. sehingga tak ada pilihan untuk menentukan templet. how to modify the link of pages ? and how to post messages in different pages ?? I seem to have only two featured articles on the homepage unless i choose older articles.i want to display like 5 articles. I have tried changing the number on the layout but it still displays 2 only. A little help will be appreciated.